The September report for browser market share is out, and I’m not really sure what to make of it as the big release of the Internet Explorer beta seems to have had zero impact. It looks like Chrome’s gains are pretty much unstoppable at this point, despite a curious dip in July. It looks like it could conceivably end the year somewhere just over nine percent of the market. What is surprising is the continuing slide of Microsoft’s Internet Explorer. These numbers hit just about the same time that Microsoft announced on its official blog that the IE9 beta had been downloaded six million times last month, making you think it would have had an uptick this month in market share. Apparently it was only current IE users upgrading, and not new or returning people? I know I haven’t used IE in ages, and I gave the new beta a pretty good spin around the Interwebs to try it out. Perhaps being limited in which versions of the Windows OS it works with impacted it? No matter how you look at it, it does seem a bit curious. Apple’s Safari continues to chug along, but despite nine months of growth, it’s only up .74 percent. Come on, little buddy, you can do it! 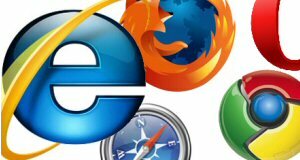 Mozilla’s Firefox continued minor gains after a rather large fall in June, and Opera continues to hover in that never ending pit of 2.3 to 2.4 percent.